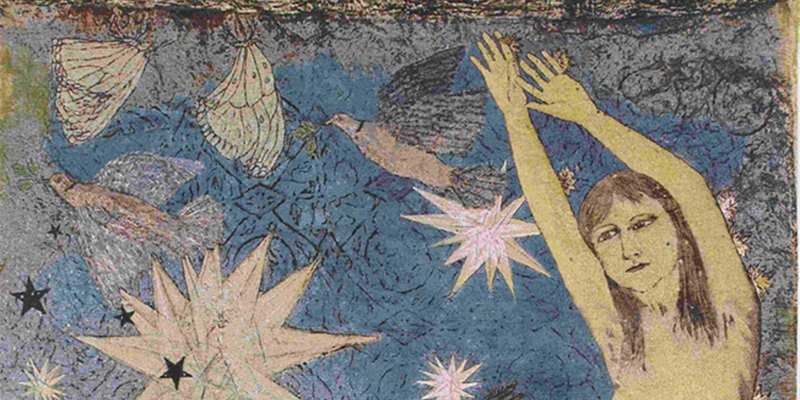 Kiki Smith, Sky, 2011, jacquard tapestry, 113 × 75". The first major European survey of the German-born artist’s oeuvre, this show promises a capacious and medium-traversing exhibition spanning three decades of work in sculpture, drawing, etching, lithography, bookmaking, photography, and video. Illuminating Smith’s trajectory from her emergence amid the aids crisis to her more recent sympathy for nature, narrative, and myth in the contemporary world, the selection of works frames Smith’s deft evocation of the necessarily transitory experience of the somatic through material means: bronze and plaster, glass and beeswax. An accompanying catalogue published by Prestelwith contributions by curator Petra Giloy-Hirtz together with those of Virginia Raguin (extrapolating on Smith’s Catholic background), Julia Bryan-Wilson (outlining her work with animals), and Ulrich Wilmes (detailing her relation to craft)will further contextualize Smith as a receiver of the medieval tradition of reliquaries and devotional texts, as well as a latter-day feminist.